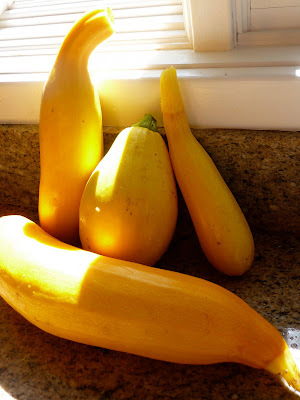 Our garden has been producing some beautiful summer and yellow squash. 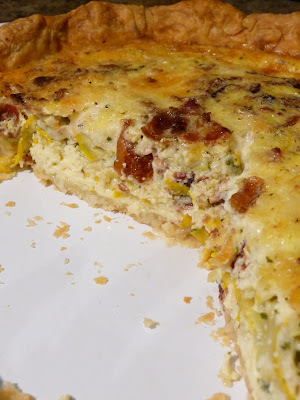 Instead of using them for a typical side dish I wanted to incorporate them into a main dish, and thought up this quiche. I've never used mozzarella for a quiche and came out very creamy! Blend flour and salt in processor. Add butter slowly pulsing until coarse meal forms. Add 4 tablespoons ice water slowly pulsing until dough comes together in moist clumps, adding more ice water by teaspoonfuls if dough is dry. Gather dough into ball; flatten into disk. Wrap in plastic wrap and chill at least 1 hour and up to 1 day. Preheat oven to 375 degrees. Roll out dough on floured surface to 12-inch round. Transfer to 10-inch diameter pie pan. Shape sides to make a pretty border. Line dough with foil and pie weights. Bake until sides are set about 25 minutes. Transfer to rack; cool completely. Reduce oven temp to 350 degrees. Heat 1 tablespoon olive oil over medium heat in a skillet. Add squash, thyme and shallots. Add any seasoning of your choosing (I used a sprinkle of 21 seasoning salute from trader joe's). Saute until squash and shallots are translucent and tender, about 5 minutes. Cool squash mixture. Whisk eggs, cream, salt, pepper and bacon in bowl. Place squash over bottom of the crust. Coat the squash with 1/2 the mozzarella and pour egg mixture over the top and use the rest of the cheese on top of the egg. Bake quiche until golden and set in center, about 35-45 mintues. Transfer quiche to rack, cool 15 minutes.